Come join a volunteer work party at The School Farm every second Saturday from noon to 4 pm to lend a hand and learn about farm work. All skill levels and abilities are welcome, even for moral support and comic relief. They will provide some water and maybe a snack, and plenty of well worn gloves, but If you’d like, bring some more refreshments to share or your favorite personal protective equipment. For more info, contact sam@eco-sf.org. 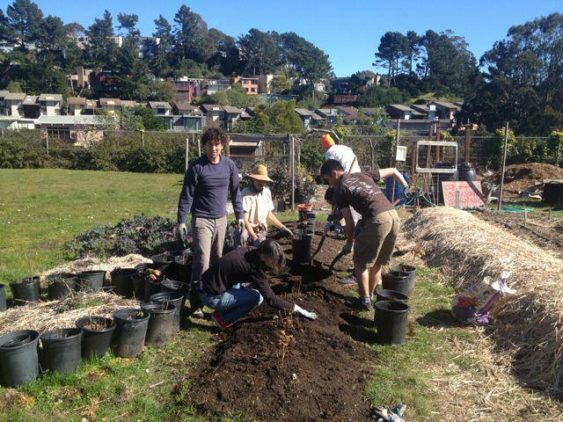 The School Farm is located on the campus of the Academy of Arts and Sciences and the School of the Arts – 555 Portola Dr. San Francisco. Enter gate on O’shaughnessy Blvd just before it crosses Portola. It’s close to 36, 44, 48, and 52 Muni lines. From the parking area at the top, proceed on foot to the right, down the hill towards the athletic field. Limited parking is available further down the driveway at the loading dock, but please do not park on the grass. The farm is behind the east bleachers across the field.